F.O.E. would end up winning their first Danny Rumph Classic in four tries by a final score of 122-102 behind a 35-point, six-rebound, four-assist performance from Tournament MVP Maalik Wayns, formerly of Villanova and most recently of the Los Angeles Clippers. Despite the crowd being staunchly against them, JT Ballas jumped out to a 19 point lead midway through the first half, 41-22. Brothers Jason and Ryan Thompson knocked down several 3-pointers early en route to combining for 14 triples on the night. JT Ballas also got two the three F.O.E. big men in foul trouble, with Markieff Morris and Syracuse product Arinze Onuaku finding themselves on the bench in the first half. Jason Thompson finished with a game-high 35 points to go with seven rebounds and four assists. Ryan Thompson would post a line of 22 points, seven rebounds and four assists. 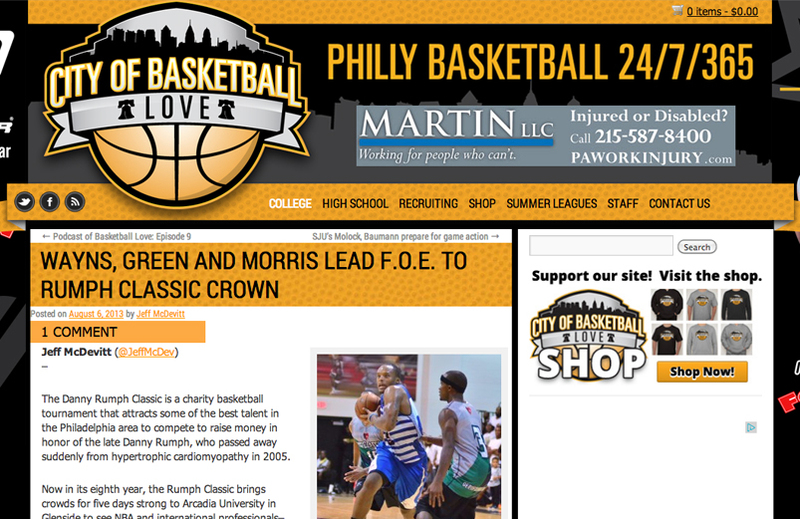 F.O.E.’s backcourt–not their big men–helped them to storm back. Wayns and former La Salle Explorer Rodney Green pushed the rock in transition to help cut the halftime deficit to two at 66-64. It was clear from the opening tip that this wasn’t your grandmother’s charity basketball game. Between the fouls that were called and the hard collisions that were not ruled fouls, both teams had something to prove on Monday night. “It’s all the best players in Philadelphia, so every time you step on the court you want to show that you’re the best no matter what it is,” Green said. F.O.E. would open the second half and put the game away, with Marcus Morris creating matchup nightmares by hitting several 18-foot fadeaways to start the final frame. Green would continue to hurt JT Ballas in transition, and ended up filling the stat sheet with 23 points, eight rebounds and eight assists. Other players in double figures included F.O.E.’s Mario Little with 11, and JT Ballas Nurideen Lindsey and Mike Ringgold, who each dropped 16 points. Wayns made sure he would deliver F.O.E. their first Danny Rumph Classic title by breaking off two impressive step-back 3-pointers right in the face of JT Balla defender Kojak McCoy. These two shots brought the fans at Arcadia’s sold out gymnasium to their feet, and an animated crowd they were. All night they booed every bucket from Thompson and crew, while cheering every dunk from the Morris’ and Onuaku. Green said his team’s popularity had to do strictly with geography. “Because they are from Jersey and we are from Philly, pretty much,” Green said. 2013 was F.O.E.’s fourth try at a Rumph Classic title, and first championship. The team featured three Prep Charter grads in the Morris’ and Green, and one of the more well-known Roman Catholic grads in Wayns. These four Philly players have known each other for a long time, and enjoy coming back from their respective cities where they play professionally to play with alongside each other once again. “We’ve known each other forever, since high school. We remained close through AAU, high school and college,” Green said. Green currently plays in for Novipiu Casale in Northwestern Italy. He averaged 18.2 points per game this last campaign and may return to Italy next season or weigh his options in Germany or France. Whatever European team Green lands with next year will get a pure scorer who is extremely difficult to stop when he wants to get to the bucket.